I am sitting here on a rainy day. It’s already June. I am looking out of the window but I can’t see anything but a dark sky. Nothing reminds me that we are supposed to be in summer here in Zurich. However there is a particular thing that makes me forget all this grey mood and keep smiling – the famous Mykonos Party by Seigi & Steli in the “Kaufleuten-Club” coming up this Saturday. The two greek brothers & entrepreneurs, who have their origin in Mykonos, bring the vibes of that amazing island once a year to Zurich. It is the place to be this Saturday where cool & beautiful people meet and celebrate an unforgettable party – one of the most famous party of the year in Zurich. Therefore no surprise that you will meet a lot of celebrities within the party people. The atmosphere and mood of this party tastes like summer and makes me hope for a sunny weather soon here in Switzerland. So you better be there or be square! But the party is supposed to be sold out however if you are one of the lucky ones who have tickets, the question arise what to wear. 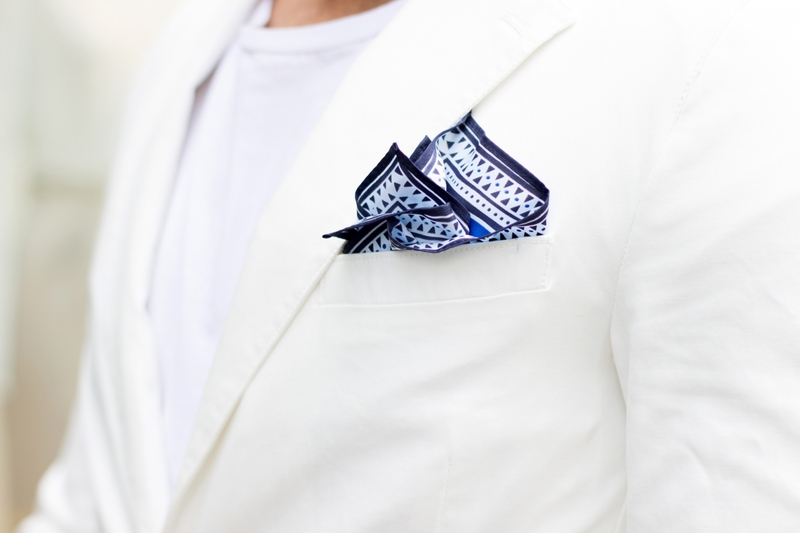 To gives you the feeling of real Mykonos summer night the dress code is strictly white – from head to toe. 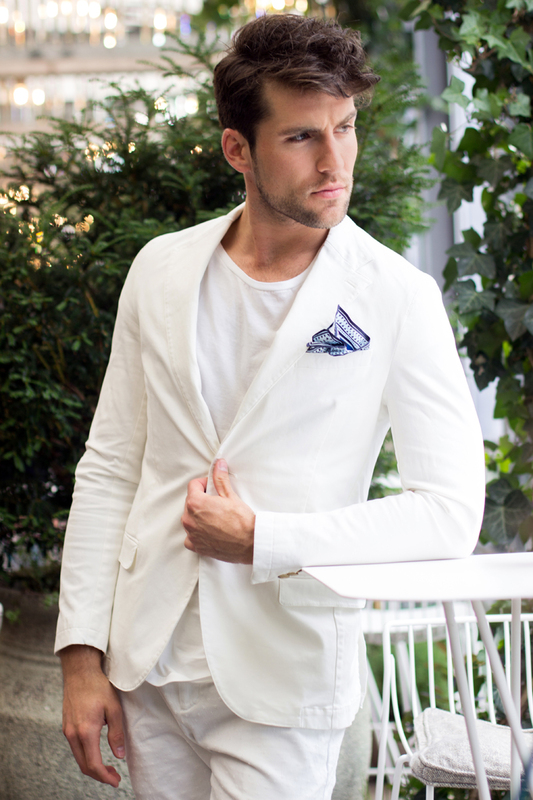 For that reason I have put together a little styling inspiration for you guys, since it is more difficult to find a cool outfit all white for gentlemen than for ladies. The ladies can easily slip into a white dress which is probably already in their wardrobe. But men are always asking: Can I wear white pants? YES, you can and it looks damn good. When it comes to a cool white summer outfit I would highly recommend to visit the Scotch & Soda Store in Zurich. 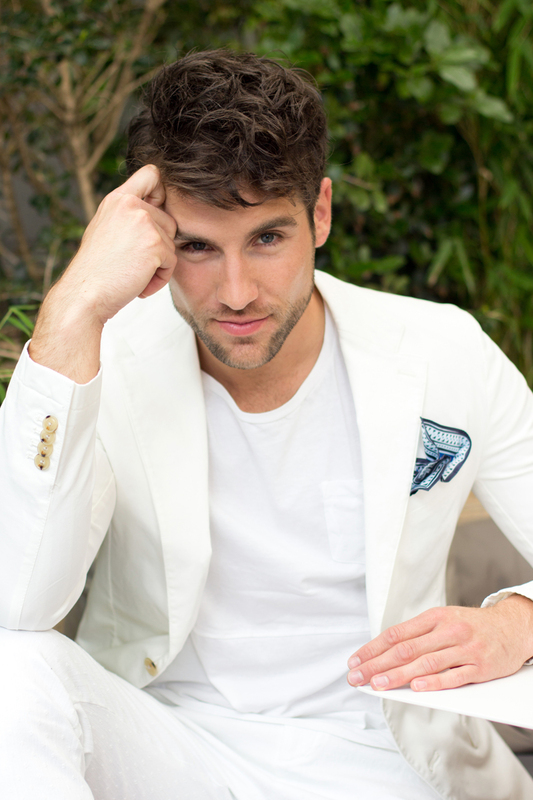 I have chosen a cool white jeans with slight stitchery combined white a clean white but tight shirt and a blazer with a modern cut. To top the outfit off and set a little color accent I added fresh white sneakers with blue lines and a blue pocket square. In my opinion it gives the outfit the right summer freshness and perfectly matches the dress code. As a variation you also can go for a white chino or even shorts since it is going to be a hot party and combine it with a dress shirt and roll up one’s sleeves. Anyway no worries you will find a lot of possibilities there since they have an extra white corner which let you make different combinations. Chosen my outfit I wanted to get into real summer mood and so I decided to go for a drink to the Hiltl rooftop terrace. This beautiful location with lots of flowers and plants brings you into the right mood even it’s raining outside. Chill back, relax and enjoy your drinks or healthy vegetarian food.